The Spa Hotel Imperial Karlovy Vary is located near the center of the city and close to many of the historical attractions that define the community. Some of the popular attractions near this provider of Karlovy Vary accommodation include the shopping area at the center of town and the St. Mary Magdalene Church. The Spa Hotel Imperial Karlovy Vary and Karlovy Vary are located approximately 60 miles from Prague. There is an international airport located in the city itself. Guests will enjoy the fact that the Spa Hotel Imperial Karlovy Vary provides accommodations which are rated at four-star levels of luxury. The hotel has a payment arrangement wherein longer stays garner cheaper per night rates. 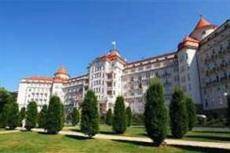 The Spa Hotel Imperial Karlovy Vary is provided with extensive health and wellness facilities. There are 13 doctors on staff who oversee treatments. The hotel also provides its guests with access to more conventional amenities which include a nightclub, a concert hall and dining options. There are also extensive sporting facilities located nearby this establishment.